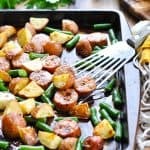 This Sheet Pan Supper is an easy one pan dinner that's loaded with Italian sausage, tender green beans, and crispy oven-roasted potatoes! Lined a rimmed baking sheet with aluminum foil and spray with cooking spray. Place diced potatoes in a large zip-top plastic bag. In a small bowl, whisk together Italian dressing mix, olive oil, garlic powder, salt, and pepper. Bake for 15-20 minutes, tossing potatoes halfway through. Remove potatoes from oven. Add sliced sausage to the sheet pan with the potatoes, toss to coat in seasoning, and return pan to the oven to continue cooking. Bake for approximately 15 more minutes; but during the final 5 minutes of cooking time add the green beans to the sheet pan, toss to coat in seasonings, and return to the oven to finish. The meal is ready when the green beans are tender and the potatoes are crispy on the outside and tender on the inside. Cooking Just for Two? Cut the ingredients in half. The rest of the cooking instructions remain the same!